Welcome back! Yesterday, I compared two uses of Google Slides in support of UDL and the impact on Student Engagement and Critical Thinking. Now consider engaging students through the curation of a Collaborative Question and Answer slide presentation. Who benefits the most from creating questions to assess student understanding? Creating the actual question requires deeper engagement with content, than simply locating and regurgitating a response. Instead of creating the review, task students with designing the questions and answers. Example: My students needed to read a chapter in their textbook, a fairly low-level/low engagement activity, and I am never sure students will actually do the reading. Perhaps my need for ‘accountability’ stretches back to my years as an elementary school teacher. But, I did not want to grade 30 responses about the same 4 or 5 questions I had written. I wanted students to engage with what they read, synthesize and summarize main ideas, and then explain their understanding in their own words. In Literacy Methods I stress the importance of setting a purpose BEFORE turning students loose in a text. When I give my students a task, I had better model what I teach! Thank you Google! Instead of constructing questions, I designed a shell. I identified key sections in the chapter of particular relevance to course objectives and state credentialing standards. Using Google Slides, I created a few introductory slides to explain the purpose and give directions, then added 60 slides with just a heading pertaining to one of 6 main ideas I had isolated in the chapter. Students had to select a slide, go back to the specified main idea in the text, and construct a question for their peers about one aspect of information within that topic. On the following slide, the same student had to write an answer to his/her question. Before another student could add a question and answer to that same section, s/he had to read any other questions in the section to make sure his/her question did not duplicate what had already been asked. The longer students waited to add to the slide share, the more they had to read to make sure they did not duplicate the work of their peers. To see the final product, click here. From the instructional perspective this requires identifying the desired student learning outcome and designing a structure for students to work within. However, students select, analyze, apply, evaluate and create the content. Once all slides are completed, the instructor can provide feedback by using the commenting feature in Google Slides (see screenshot), but keep in mind that comments are viewable by all students. An alternative would be the use of a rubric, in which a ‘score’ can be assigned to each student’s slide. To give students feedback, use the ‘comment’ feature in Google Slides. To borrow from Stephen Covey, “Begin with the end in mind.” Consider the end product you want students to create. Then design the shell within Google Slides. Example: After engaging in a Module on Academic Language, I wanted students to apply this skill to children’s literature. To demonstrate mastery of learning objectives, I wanted them to create a Google Slide Presentation that introduced a children’s book with six slides introducing and defining 6 terms that could be barriers to students’ comprehension of the text. To demonstrate mastery of UDL through Multiple Means of Representation, my students had to include visual and/or audio representations of content. Through Google Classroom, I provided each student with a copy of the Presentation Shell, and they submitted their completed presentation. To view a sample of the shell, click here. To view a finished presentation created by a student, click here. TIPS: Learn from my mistakes! Copy Slide Shells before you share them with students: Once you create the shell for your slide activity, copy it, and then share your copy with students. I suggest retitling your copy to reflect the current semester i.e. Fall 2016. This way your shell will remain a blank template you can use in subsequent semesters. To learn how to make a copy, watch the video. Use Advanced Sharing Settings: Before you share a presentation, you will need to set the advanced features in the sharing settings to make sure all students have access. Being unable to access an activity can be frustrating and diminish student engagement. Watch the video for a brief tutorial. If you are new to sharing docs, I suggest finding a colleague and practice sharing links! 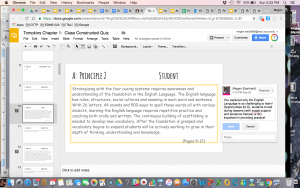 I hope you have gleaned at least one new way to use Google Slides to support UDL and critical thinking. I am really curious to know how Google Slides are being used campus wide. If you have a hidden gem in your Google Drive, please share by leaving a comment. I am tinkering with two other uses for Google Slides. Look for more in December. I have a feeling the best is yet to come! If you want to use Google, but need some support, Teaching and Learning Innovations will provide Faculty Workshops in the Spring. If you want more information, add your name and email to the Google Doc. We will be in contact soon! Until then, ready, set, GOogle! Happy creating . . . maybe I should say, CURATING!